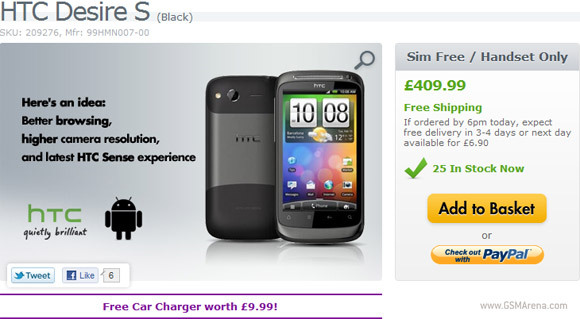 The HTC Desire S is currently available for purchase from the well-known UK retailer Expansys. The price has been altered a bit from the phone's pre-order period from 500 euros to 466 euros (410 pounds). Not only that, but Expansys also throws in a free car charger, worth 10 pounds. For those of you impatient to get the Desire S, it'll cost you 7 pounds for a next-day delivery. Or you could wait a couple of days and enjoy the free shipping option. Announced at the World Mobile Congress this year, the Desire S packs a 1GHz single-core second gen SnapDragon processor, 768MB RAM, a 5MP snapper and a 3.7-inch capacitive touchscreen. The device runs the latest version of Android - 2.3 Gingerbread, so you won't have to wait for an update from HTC like the Incredible S owners.